1. Dry roast peppercorns and fennel seeds. Grind them into fine powder. 2. Heat oil in a frying pan, add bay leaves, cinnamon, cloves, cardamom one by one and fry. Add onion fry till transparent. Add ginger garlic paste and slit green chillies fry them for few minutes. 3. Add chicken pieces, turmeric powder, garam masala powder, salt and ground pepper - fennel powder mix well. Cover the lid and cook the chciken. 4. 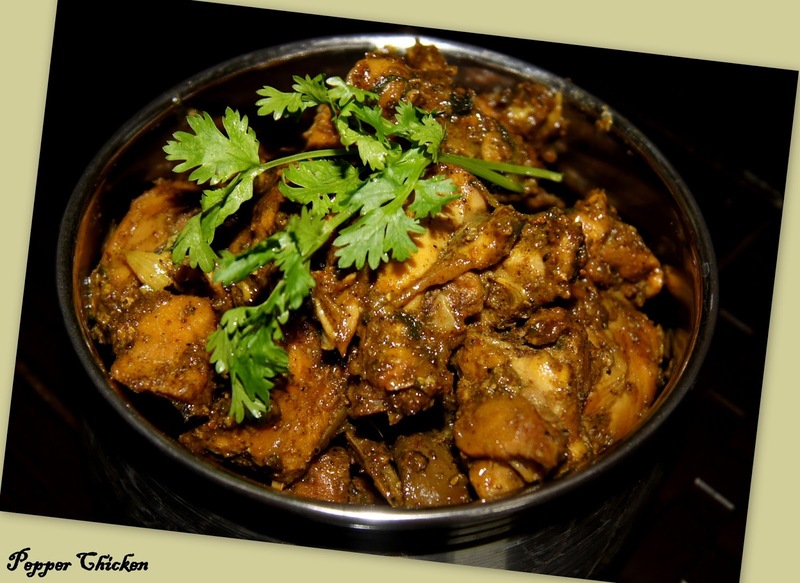 Once the chicken gets cooked and all the water evaporates add lemon juice, coriander leaves and curry leaves. Switch off the stove. 5. Spicy pepper chicken is ready to serve.